6 weeks ago, Diogo, a 22 year old man, paced nervously outside our church building. He didn’t want to come in even though his girlfriend, Catarina, was performing in the Christmas play that Sunday. Genilson, one of the leaders in the church, went outside to talk with him to see if he would come in. Diogo said that he didn’t really believe in God, and that he didn’t like church. But finally, after some negotiation, he came inside to the service. Fast forward to this past Sunday. After the service, Genilson came up to me eagerly and said,“Diogo wants to get saved today.” The three of us sat down together and Diogo prayed to receive Jesus as his Savior. Praise God! How did this happen? Simply put, God did it. For the past six weeks, Diogo came each Sunday and heard God’s Word proclaimed. Little by little, his demeanor changed. We began to notice an eagerness in his life to know more about God. He met with me for coffee, and we talked about life. He asked how he could help with things around the church. Finally, it all clicked and he knew he needed to be saved. 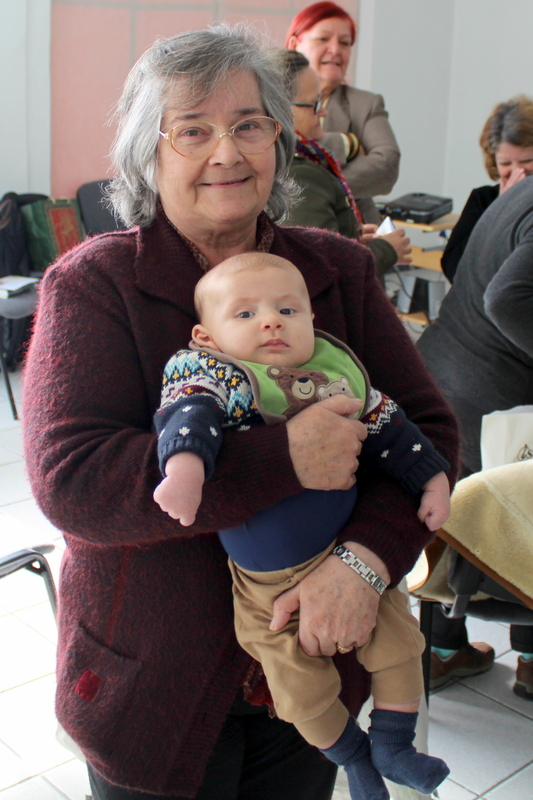 Pray for Diogo that he would be like the good ground in Jesus’ parable, and that he would grow in his faith. Besides this, we continue to see encouraging progress in the ministry. 15 different people have helped clean the church, bring cake for fellowship time, help with nursery, or greet visitors. It is exciting to see people want to serve. José Balegas, the man who taught the music class at church last fall, is teaching another class. Each Saturday, 12 unsaved people, who do not attend our church, come to his music class. It has been a great way to make contact with the community. Also, during this winter, I am teaching a Bible institute class on the Minor Prophets. Last time, I taught at this Bible institute, I went by myself each week to teach. This time, I have three men with me from church who signed up to take the course. What’s happening with the Deaf? “When we die, what are our bodies like in heaven? Do we become angels?” “I read something about the parting of the Red Sea. Let me tell you about it.” “What are these numbers for in my Bible?” These were some of the questions and comments at deaf church last Sunday. The story was about the Samaritan woman, but afterward we opened it up for questions. We were encouraged to see the ten deaf there feeling more comfortable with each other and us. We loved seeing what was on their minds, and they now have a place to get Bible answers in their own language. They all also now have a picture Bible and a written Bible. Patricia (our deaf tutor) came for a second time. She asked us for a picture Bible, and we were thrilled to give her one. 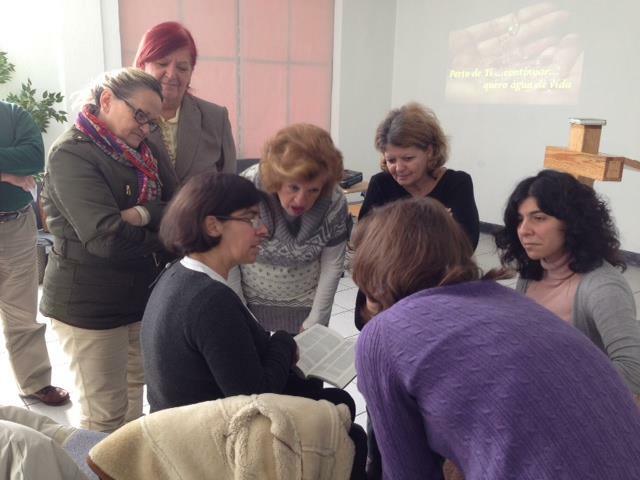 We have longed for a deaf church in Portugal. At each service, we are amazed and humbled that God brings people and communicates to them through us. Please keep praying for the deaf. Finally, we have some exciting news we want to share with you. This fall, we will be coming back to America for a six month furlough. By then, we will have been here in Portugal for four years. While it will be hard to leave our work here for that long, it will be wonderful to get to see so many people that have been praying for us over the years. If you are a pastor reading this letter, let us know if you would like us to come visit your church if you haven’t done so already. Our goal while on furlough is to express our gratitude, to encourage, and to share what God is doing here. Pray for us as we make preparations for the work here during our absence. One last note, our mission agency recently added online giving as a feature. So if you aren’t one to write checks, but would like to participate financially in the ministry in Portugal, click on this link. It takes only a minute to make a contribution.